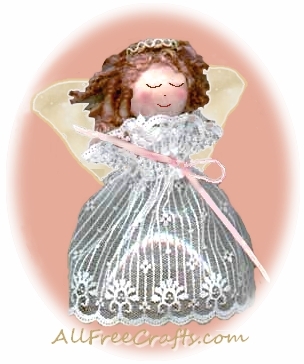 Recycle a plastic soda bottle or pop bottle to make this pretty angel ornament for Christmas. Begin by cutting the top off the pop bottle. With a craft knife, cut just below where the bottle has curved and becomes straight (about four inches down from the top). Your lace or fabric will need to be as long as your bottle is, plus 1 1/2 to 2 inches. Measure around the bottom of your bottle top, add two inches and this is the length of lace you will need to create the angels dress. Cut a piece of lace to these dimensions. Glue a piece of decorative trim around the top pour spout of the bottle (this will hide any pop bottle that may show through once the dress is attached). Feed a piece of ribbon in and out of your lace (about 1 inch in from the edge), to create a gathered effect (this is the ribbon tie that you see just below the neck area). Tie this ribbon into a bow, pulling to fit around the bottle spout bottom. You may want to secure the lace with a dot of hot glue if the lace won’t stay in place. Glue doll hair to the wooden ball and tie back in a pony tail with a small piece of ribbon. Glue the flat side of the wooden ball to the bottle top (pour spout). Glue angel wings to the back of the angel (see photo) and tie a small bow of decorative trim, then glue the bow to the centre back of wings. Keep the bow tails long enough to extend down the dress. Secure the bow tails to the dress with just a drop or two of hot glue, running the trim down the back of the dress. Create a halo, using a piece of ribbon or decorative trim and glue the halo to the top of the head. Paint a face, using coloured pencils or markers. The face is simply lines for the eyes and mouth and a dot for the nose. Blushed cheeks can be added, using a red or pink pencil.